12 pp. Roman, 359 pp. In the book dedicated to Professor Larry Michael Hyman (University of Berkeley/California, USA) articles with a broad range of topics are published. Their authors all share a deep gratitude for the inspirations and knowledge they have gained from the honoured professor, who has been working on Bantu for three decades. With the present work the editors want to encourage research on little known Cameroonian languages and provide a working tool for established scholars as well as advanced students of linguistics. The book consists of four main parts – phonology, syntax, sociolinguistics and a part of general interest including guidelines and questionnaires. Each part is made up of articles on various – predominantely Cameroonian – language groups, i.e. Narrow Bantu, Grassfields Bantu, Bantu Zone A, Ekoid, Mambiloid and Chadic. En dehors des êtres humains, qui peut parler dans notre culture? Furthermore, the following analyses, dictionaries and text collections of Grassfields Bantu langues are also available in our programme. [...] "Research Mate in African Linguistics" is an instructive collection of introductive papers in different fields of African linguistics, with particular focus on Cameroon. Many of its papers are surely suitable for integration into an introductory course in African Linguistics. Due to its broad range perspective and its affinity with L.N. Hyman’s research agenda, it is beyond doubt that the honoured professor will have been sincerely honoured with this nice token of appreciation. [...] this book gives an excellent overview of current topics and complexities in Cameroonian linguistics, at the same time pointing to the white spots on the linguistic map where research is urgently needed for a more adequate description of the semantics and pragmatics of Cameroonian languages. 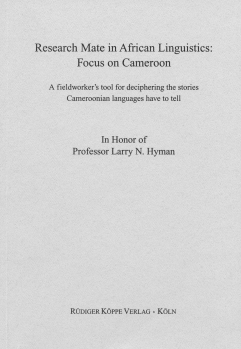 Although the book is “weighted” to the applied side and clearly aimed at the student and research beginner in Cameroonian languages, it holds a lot of insight and inspiration for more advanced scholars and will, hopefully, encourage more linguists to direct their attention to deciphering the fascinating stories Cameroonian languages have to tell.